Every once in a while I come across a dish at a restaurant or other eatery that literally impresses me to the point of sheer happiness. Something as simple as an incredible soup or inventive pizza can make me remember a place for a lifetime. A dream dish, so to speak. Take Bread Line, a popular soup, sandwich and salad joint near the White House (near Penn and H). They use fresh, top line ingredients in creative uses and have different menu items each day. However, the place is overwhelming to say the least, as its always packed and zooey, yet the order taker seems to only be focused on you as soon as you're within his eyesight and he's barking for your order ten people back. Some people don't have the heart for it. Or the wallet, with most orders coming to at least ten if not fifteen dollars for lunch. Needless to say there is still a lot of hype around it and it is one of the best lunch places around. But to this point I've never been all that impressed. The soups seem lazy, the salads heavy and most of the special sandwiches a little overdone. So lately when I have ended up there, I've found my niche in their regular menu items. Often overlooked, this section contains some of the finer and simpler sandwiches than their far more hyped "special" brethren. Which gets us to the turkey. 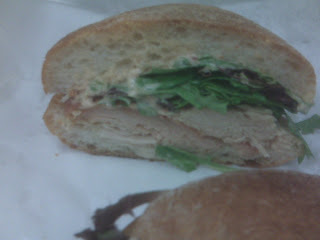 The very first regular sandwich on the menu is so hidden away by all the specials and other garbage that my colleague, who has been going there for years, was unaware of the existence of the turkey until my recent discovery of it. And oh what a discovery! It is so simple, so well done and so mouthwatering. It is a sandwich I'll be craving for a long time, and I'll have to restrain myself with lunches brought from home so as not to go and order it for 8 or more dollars several times per week. Just imagine. Moist, fresh turkey, roasted daily in house – white and dark meat, piled high on Bread Line's own freshly baked, soft and pillowy ciabatta. Add a big pile of wild greens and a squirt of flavorful, delectable Russian dressing (no cheese needed) and it's done and perfect. It is a simple, delicious and masterful delight. The perfect meld of flavors and textures. Unparalleled in turkey sandwiches I've ever had before. So now I can believe a little of the Bread Line hype, as long as they never get rid of the turkey sandwich. My dream sandwich. It's not every day I find a dish anywhere I'd be willing to dream about. So Bread Line deserves the credit – finally.